When we found out Jacob has Down Syndrome it was emotional for our parents, family and friends too. We have received amazing support from our friends and family. Below are a few things that may be helpful as you are supporting your friends & loved ones on this new journey. We must sometimes remind ourselves to communicate about children with Down syndrome in a positive and accurate manner. The following suggestions may help in that effort. The emphasis should always be on the person first, not the disability. When we take care to put children first and let the disability remain in the background, we are teaching others where the emphasis needs to be. This term is the common reference to describe delays in development such as language, walking, and all other areas of a child’s learning process. Most families find it much less offensive than the term mentally retarded. Someone who has Down syndrome is not a victim of, diseased by, nor do they suffer from or are they afflicted with Down syndrome. They simply have Down syndrome. 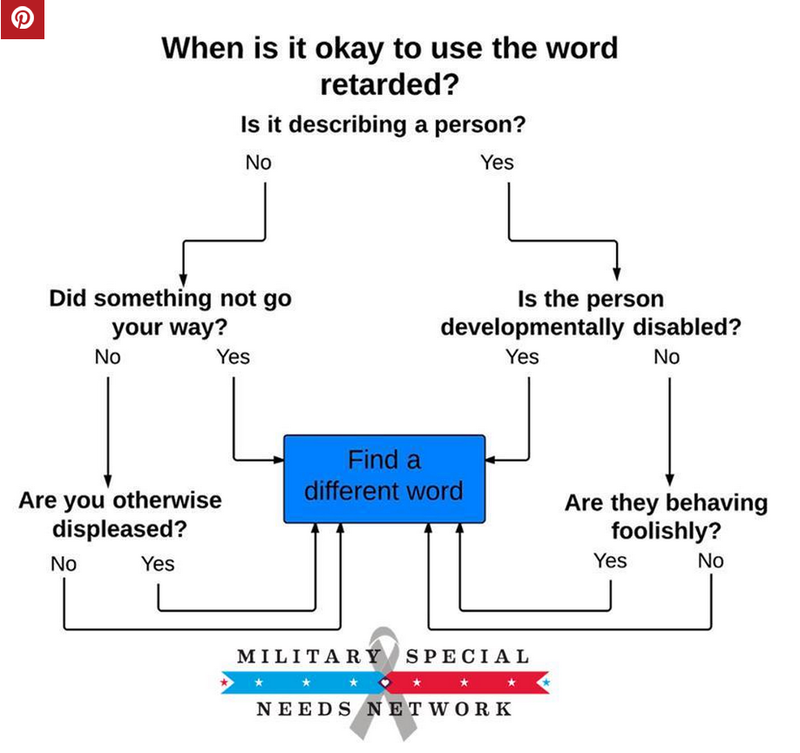 Both of these terms are acceptable and positive ways to refer to people who do not have Down syndrome or another disability. This terminology focuses first on the disability rather than on the child. This common misstatement causes parents to cringe, at least inwardly. Please realize that we perceive our children as being pretty normal kids. Comparing them to normal children implies that a child with Down syndrome is something less than normal. The best reference is developmentally delayed (for children) and developmentally disabled (for adults). As most of us know, this extremely outdated term once referred to people with Down syndrome. This insulting word should never be used when referring to or about someone with Down syndrome. A person either has Down syndrome or does not. Down syndrome is not an illness. Having Down syndrome does not mean a person is sick. Although the chances of a woman having a child with Down syndrome increase significantly over the age of 35, there are far more children with Down syndrome born to younger mothers – they are having more babies. There is no “s” or ” ‘s” in the name of this syndrome. Our children are not suffering or afflicted. We must instill a sense of pride and self-esteem in all children to ensure that we do not make anyone feel that Down syndrome is something terrible to be ashamed about.